Only touched people, can touch others, only blessed people can bless others, Only anointed people can anoint others, only liberated people can liberate others, Only empowered people can empower others, Only Ordained Leaders can make meaningful landmark in their generation and cause the people to flourish like a cedar of Lebanon. We are excited to be writing about one man that we so much love in the world today who is causing waves of glory all around the globe, and his impart is so profound and can’t be neglected – Bishop David Olaniyi Oyedepo. Bishop David O. Oyedepo (born September 27, 1954) is a Nigerian Christian author, preacher, the founder and presiding Bishop of Living Faith Church World Wide, also known as Winners’ Chapel, and its affiliated international churches known as Winners Chapel International, with headquarters in Ota, Ogun State, Nigeria. The Liberation Mandate: On May 2nd 1981 at the end of a visionary encounter that lasted about 18hours, God gave a command to his servant Bishop David Oyedepo – “The hour as come to liberate the world from every operation of the devil by the preaching of the word of Faith, and I am sending you to undertake this task – The Liberation Mandate”. From this encounter, as mandated by God; Bishop david oyedepo took off into destiny gradually, and grew from a church of 4 standing members in 1983 to a congregation of more multitudes. Early life and history: On September 27, 1954 David Olaniyi Oyedepo was born in Osogbo, Nigeria, but is a native of Omu-Aran, Kwara State, Nigeria. He was raised in a mixed religious family His father, Ibrahim, was a Muslim healer. His mother, Dorcas, was a member of the Eternal Order of the Cherubim and Seraphim Movement (C&S), a branch of the Aladura movement in Nigeria. He was raised by his grandmother in Osogbo, who introduced him to the virtues of Christian life via early morning prayers which she attended with him. She also taught him the importance of tithing. Oyedepo was born again in 1969, through the influence of his teacher, Betty Lasher, who took special interest in him during his high school days. He studied Architecture at the former Kwara State Polytechnic, he worked briefly with the Federal Ministry of Housing in Ilorin before resigning to concentrate on missionary work. Oyedepo received a Ph.D. in Human Development from Honolulu University, Hawaii, United States. After The encounter of The Liberation Mandate; Living Faith Church World Wide (LFCWW) emerged, first called Liberation Faith Hour Ministries, in 1981. Two years later, on September 17, 1983, Pastor Enoch Adeboye, General Overseer of the Redeemed Christian Church of God, ordained David and his wife, Florence Abiola Akano (known as Faith Abiola Oyedepo) to become pastors and officially commissioned the new church. 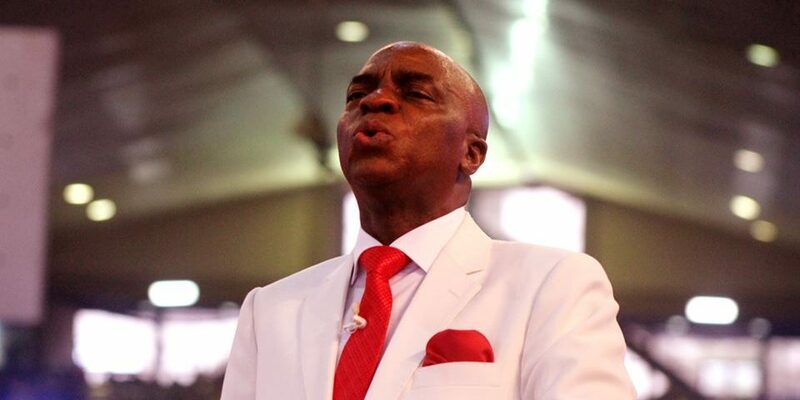 Five years later, Oyedepo was ordained as Bishop. Living Faith Church (AKA Winners Chapel) started in Kaduna but moved to Lagos, the former capital of Nigeria in July 1989, to start a new branch of the church after Oyedepo claimed to have received instructions from God to reach out to the people of Lagos. By The virtue of Grace, Bishop David Oyedepo is the wealthiest preacher in Nigeria with a net worth of over USD $150 million. The church owns four private jets and several buildings around the world, including London and the United States. Oyedepo is an author and publisher who has written over 70 titles apart from periodicals. He is the Chairman/Publisher of Dominion Publishing House (DPH), a publishing arm of the ministry. DPH has over 4 million prints in circulation to date. Through Oyedepo Covenant University, Faith Academy and Kingdom Heritage Schools have been established to equip the youth for global impact. The construction of a third university named Crown University is already underway, located in Calabar, Cross Rivers, Nigeria. Place of Worship: Bishop Oyedepo claims that in 1998 he was instructed by God to build a new base for the Commission to accommodate the increasing number of worshippers. This resulted in Bishop Oyedepo’s church’s acquisition of the initial 530-acre (2.1 km2) facility, known as Canaanland, which serves as the headquarters. It is the home of the 50,000-seat capacity auditorium, the ‘Faith Tabernacle‘, which is reputed to be the largest church auditorium in the world. This was a feat also recorded by the Guinness Book of Records. Construction was completed within 12 months. Reports also claimed that this building was built debt free. This 50,000-seat edifice was dedicated on September 18, 1999 under the administration of former President Olusegun Obasanjo. Canaanland is in Ota, Ogun state and is the 5,000-acre (20 km2) estate and campus, that houses The 50,000 church building, the church secretariat, the church’s youth chapel, a primary school called Kingdom heritage model school, a full boarding mission secondary school called Faith Academy, with over 1,500 students and the Covenant University facilities, which accommodates over 7,000 students, fully resident in ultra-modern hostel facilities, with fully equipped faculty buildings and numerous staff housing facilities. Canaanland campus also has for profit establishments operated by the church such as a bakery, a bottled water processing plant, a petrol station, various restaurants and shopping stores, several residential houses that provide for the over 2,000 church employees, and guest houses. The whole of Canaanland which includes a proposed 15,000 housing estate known as Canaan City had increased to 17,000 acres as at 2012. Christian ministry: The teachings of Bishop Oyedepo has put him in the category of what is commonly called the Word of Faith Movement. He has referred to principal exponents of the Faith Movement such as Kenneth Copeland, Gloria Copeland, Kenneth E. Hagin, E. W. Kenyon, T. L. Osborn, Smith Wigglesworth as well as renowned Nigerian preachers Pastor Enoch Adeboye and the late Archbishop Benson Idahosa as mentors. His Winners Chapel operates a Bible training programme known as Word of Faith Bible Institute for members and non-members alike to develop knowledge of Christian principles and to develop leaders and future pastors. This institute is run in major branches of the Church. Oyedepo is the President of David Oyedepo Ministries International (DOMI). DOMI is the umbrella organisation comprising Living Faith Church World Wide (a global network of churches), World Mission Agency (WMA); the global missionary arm of the church’s operations, Dominion Publishing House; the publishing arm of the church, Covenant University, and the Social Development Missions projects (made up of hospitals, maternity homes, schools, etc. With such a deep understanding and leadership skills; Bishop Oyedepo has criticised corruption in Africa as a whole and poor leadership in government, and he as been committed to be a wave of change in the land. Book publishing: Oyedepo’s church also operates its own publishing house, called Dominion Publishing House (DPH), commissioned on December 5, 1992 which has published over 70 Christian, inspirational and motivational books, mini books, magazines and other resources. Family life: In 1982 he married Florence Abiola Akano (now known as Faith). They have four children together (David Junior, Isaac, Love and Joyce). David Junior and Isaac Oyedepo were ordained as Pastors in May 2007 by Kenneth Copeland. David Junior pastors the London Branch of the Church with His wife, Kemi while Isaac Oyedepo pastors of Winners’ Chapel International, South Africa with his wife Ayomitide. David Oyedepo Day of Service- (DODOS) Launched: The DODOS is an initiative set up by the Covenant University Alumni Association with the aim to promote the contribution and value adding lifestyle of Bishop David O. Oyedepo. Started on the 27th of Sept. 2012, which also is the Bishop’s birthday, people around the world who connect with this initiative are expected to show an act of contribution to individuals, organizations or the society at large. Bishop Oyedepo is one of the pioneer of faith in Africa and has been considered as one of the most powerful Preachers in Nigeria, he’s the founder and the president of the Living FAITH Church Worldwide, also known as “Winners Chapel” he serve as the senior pastor of Faith Tabernacle, in 1987 bishop oyedepo had a grass cathedral where people converge to worship God and hear the word of faith from the Lord, but today, FAITH TABERNACLE at Otta, is considered to be the largest church in the world with a total of 50,000 seaters where 5 services hold every Sunday, Faith tabernacle was built totally debt-free in 12 month with all equipment gotten from Nigeria in Africa, the amazing feature of this great auditorium is that, there is no pillar holding it from the top downward, with a manifold wisdom God’s servant Bishop David Oyedepo explained that the idea came from the perspective of how God created the heaven and earth without a pillar and the heaven never fell on the earth, Faith Tabernacle was dedicated on September 18, 1999. In Addition to Faith Tabernacle, Winners chapel as been recorded to have church branches across villages, towns, cities in over 4,000 Locations in Nigeria as well as 60 other Nations, spread across 5 Continents of the world. In 1984, The Ministry had a Little car as the only official Car of the ministry but today at the head quarter (Faith Tabernacle) they run nothing less than 5,000 buses conveying people from church to their various destinations in the city and bringing them back to church next Sunday. All workers and staffs are entitle to personal vehicles. As part of the administrative skills of bishop oyedepo, he as gone from a work load and staff of 3 to thousands including co-ministers, pastors, administrators, I.T Specialists, technical workers, and army of teachers and non teaching staffs in the primary, secondary and tertiary institutions respectively , and over 2000 skilled and unskilled laborers in the construction industry alone. Bishop’s Dominion Bookshop: As a potent and impactful writer, Bishop Oyedepo as authored and publish so many anointed and impactful books that as brought many to lime light with their destiny and led to so many breakthroughs and testimonies. Dominion bookshop is the label of the ministry’s book selling store that is always at the church state headquarters. As an Educationist, his mission and contribution is leading a revolution of top class in education development in Nigeria, with building massive education institute at all levels. The Ministry runs a network of Kingdom Heritage Nursery and Primary School across the nation; secondary – Faith Academy’ is a full running school with all facilities to enhance the learning and good academy standard for students located in Canaanland Otta. Convenant University; a royal academy founder in October 2002 was design to raise a generation of leaders across the continent of Africa, with the best of top class modern university facilities to enhance good learning and experimental exercises for the best of emeritus and relevant learned generation. Also an extension of the academic exploit is Landmark University; founded to drive an agricultural revolution in Nigeria and at the continent of Africa as a whole, Bishop Oyedepo currently serves as a chancellor in both Universities, Canaanland is in Otta, The 5,000 acres and campus that houses the 50,000 seat church building, the church secretariat, the church youth chapel, kingdom heritage mother schools, the 4 boarding missionary school, faith academy with over 1500 students and the university facilities which houses over 7,000 students who resides in ultra modern housing facilities and numerous working staff housing facilities, canaanland campus also as 4 plants establishments operated by the church which includes; a bakery, a bottle water processing plants, various restaurants and shopping stores. Several housing stores, that houses over 2,000 church workers , 4 banks also operates in the city, 3 of which are commercial banks and one which is a micro finance bank operated by the church, bishop is a recipient of so many national and international awards covering ministry, leadership and management. The profound success of the ministry, the school, the church and other organization are all proofs of God’s faithfulness in the live of his servant, as he always confirm his calling via many signs and wonders especially which the world has never seen it type before. Bishop has been a mentor to so many in life, business, leadership and ministry. Some of the sons of bishop in ministry includes; Pastor david oyedepo jnr, Pastor Sam Adeyemi, Dr Paul Enenche and many more. The ministry also as a yearly in-gathering of faithful members, and non-members with viewing of the program livestream online and various branches of the church across the world, called Shiloh, 2015 shiloh captured almost the whole world attention, as more than 500 million connected online to watch the program. Bishop Oyedepo ministries many years ago, as held countless crusades all across the world targeted towards saving souls of men and liberating them from every operation of the devil. Bishop Oyedepo’s ministry is indeed a blessing to humanity, not just a blessing but a great blessing; so many miracles, signs and wonders are recorded by the power of Jesus in winners chapel, one of the mind blowing testimony was the raising of over 12 dead back to life in the year 2012. Also in Shiloh2015, we had cases of HIV Positive turning negative, a lot of barren women gave birth, a lot of jobless youths are now employers of labour, I remembered a church member at faith tabernacle testified that he has been blessed of God and at 18years, he’s now a landlord. It is meant to save a generation and that is why it is built in a form of an ark, There is a whole lot that is embedded in The New Faith Theater church auditorium and with a little of features that as never been seen in many part of the world especially in the church system; God be praised! You too can connect to a heavy increasing grace of God in the life of his servant by connecting to the grace, worship with us at any centers of living faith church worldwide and you can be sure of living a life of unquestionable dominion. If you have been blessed by the Ministry of Bishop David O. Oyedepo, drop your testimony below as a comment and do remember to share this post with your friends.